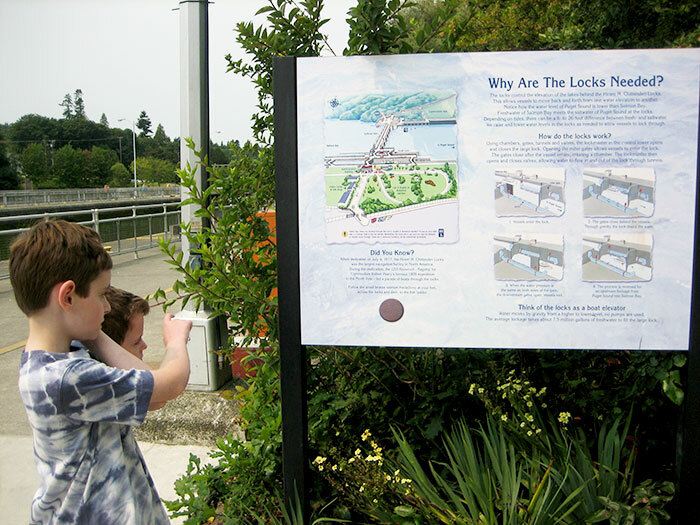 Last week, I decided to take the boys to see the Ballard Locks. Jason heard my plans and begged asked nicely that we wait for the weekend, so he could go, too. 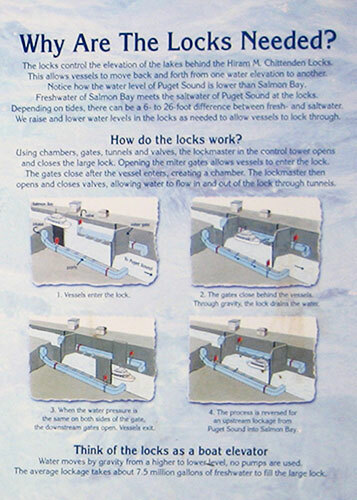 There’s something about the phrase “fish ladder” that’s intriguing, not to mention the sheer coolness of the locks’ engineering. So we went today. The Locks are pretty darned amazing. 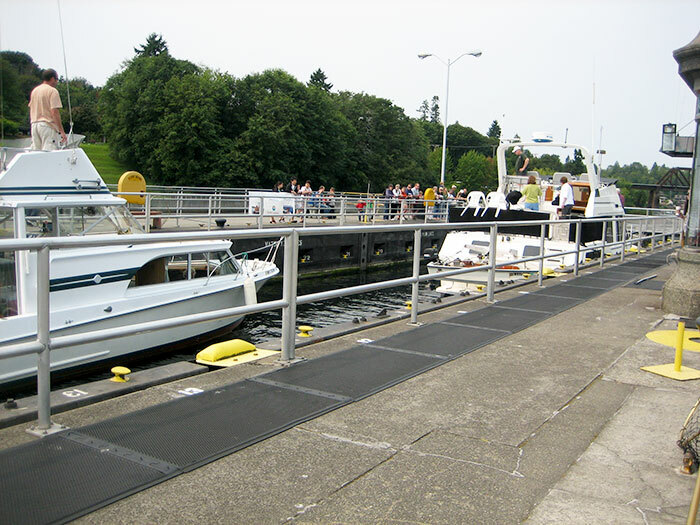 We arrived as a group of small craft piled into the lock to make the descent from Lake Union to Puget Sound. Boats going down! They also manage to change the water the boats are sitting on from fresh to saltwater. Lake Union is freshwater; the Sound, of course, is salt. The engineering of it all is pretty darned cool. But enough about the science, right? We want to see the fish ladder! You can tell by the look on his face how hard he’s working to get up that staircase. 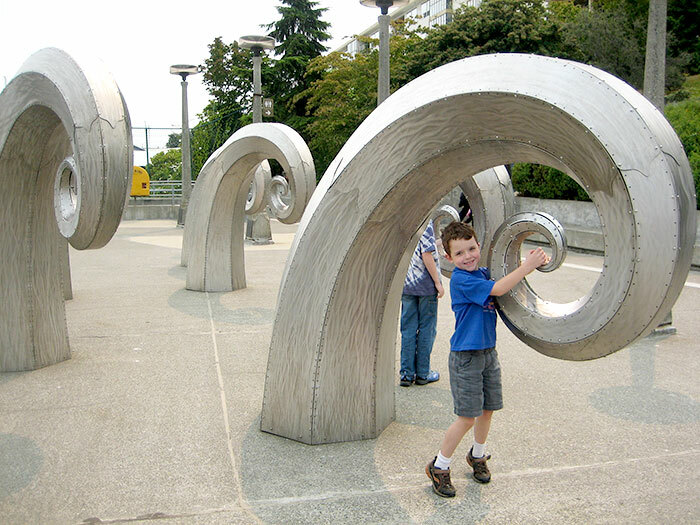 Seattle = GREAT public art. Everywhere. I love saying that. 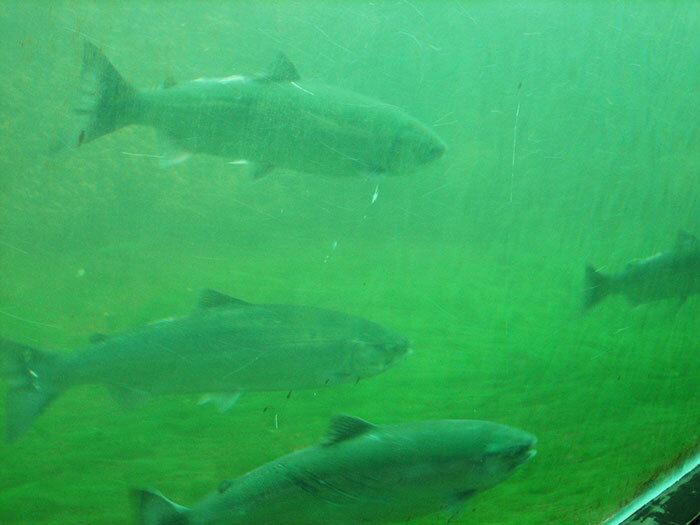 Fish ladder fish ladder fish ladder. Huh. All of that, and I didn’t get any pictures of the actual ladders. 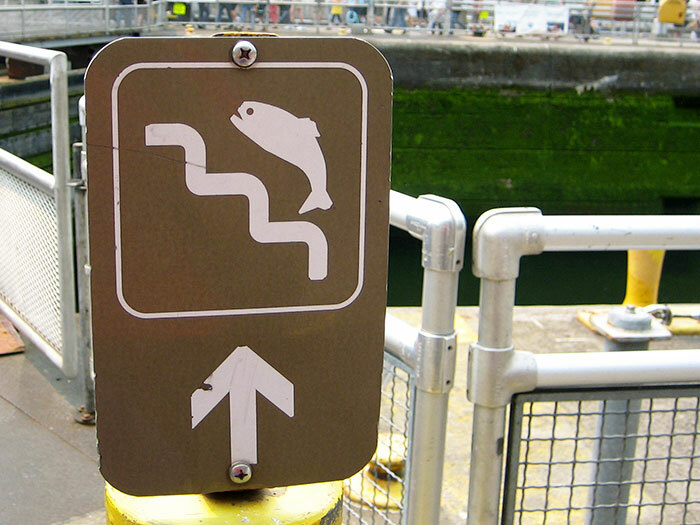 In my defense, the fish weren’t doing much publicly-visible climbing. I think this guy is a Chinook. He was HUGE. Dinner for six, at least. It was pretty incredible. We’ve seen fish that close before, of course, in aquariums. 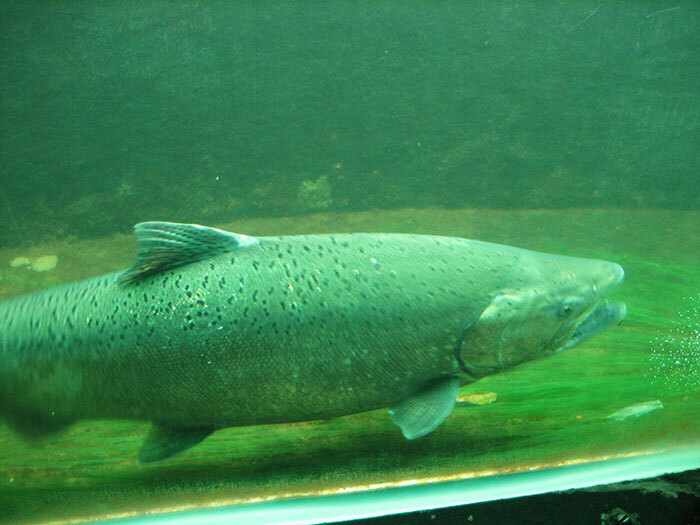 But these are wild salmon, on their way “home” to whatever stream or hatchery from whence they came 2-3 years ago. 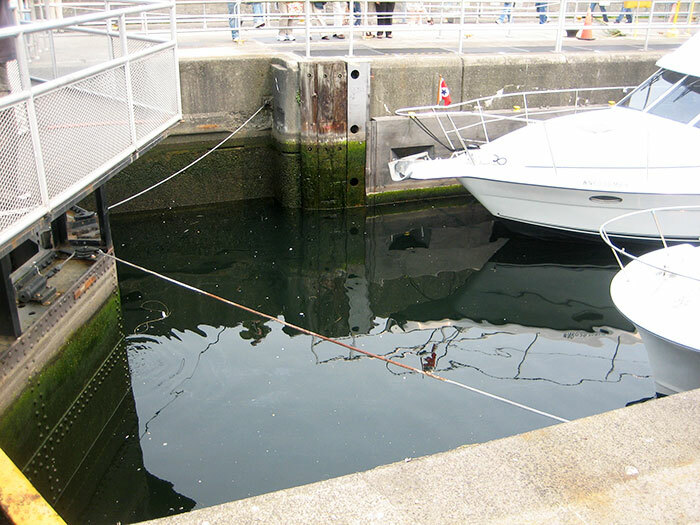 The ladder was built for them long before salmon habitat conservation was a major concern in the area, and it saves them from getting all smashed up in the locks. Pretty great planning. On the way home, we went to a great burger joint in Ballard. I had a salmon burger. With tartar sauce. Yum. Where’d You Get That Smile? Forgive my absence; we have guests! Jason’s parents are in town for a week. We’re a little giddy with seeing family. I love photos like these. It’s not until I see it in a still picture that I realize where the boys get their features. Nicolas has Grandpa Wayne’s smile! In everything else, he tends to look like his Grandma’s side of the family, but it’s nice to see a little of the family name in there, too. It’s a sunny-ish Tuesday in Seattle! Methinks we’ll be taking a walk down to the school playground to practice a bit on the monkey bars. I know certain people reading this have an innate fear of the injuries for which monkey bars are often responsible and will want me to drive down there in case we have to make a side trip to the ER on the way home, but what can I say? I live on the edge. 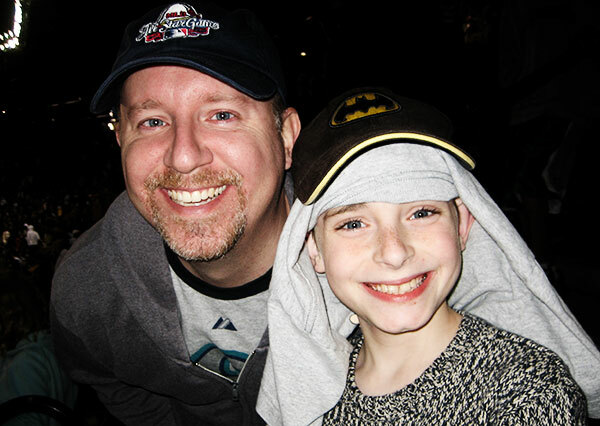 Have you ever been SO freaking proud of your child that you want to shout it from the rooftops, but you can’t, because you don’t want to call attention to your child, because the accomplishment of which you are so proud could be highly embarrassing to him? Yeah, that’s how I feel. On second hand, forget I said that. You didn’t read/see anything. Right? 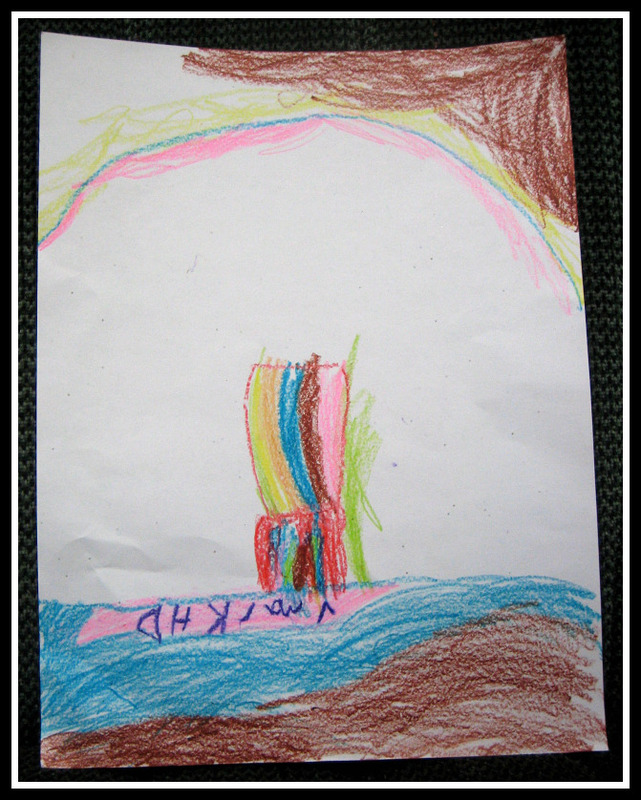 Yesterday, Kalen colored a picture for me. When I went to write his name and date on the back (he prefers to leave his artwork unsigned…to confuse art collectors of the future, maybe? I, for one, am easily confused and learned the hard way to name and date everything. ), he said, “It’s going on in…2011. That’s the date of it. 2011…March 21st. Okay, Mom?” Sure, kiddo. I have a strong feeling I’m going to be the recipient of lots of priceless artwork this summer. The hallway will be quite the art gallery! Bring it on, boys. This morning, Nicolas brewed coffee for me. I joked in a sleepy haze yesterday that I should teach him to do so, and he said, “YEAH!!! I want to learn!” Score! It’s no secret that we’re a moderately geeky household. Today I give you proof. Not that you needed any. But GeekDad is running a Geeky Family Photo Contest, and last night, we broke out the boys’ Mythbusters Science Exploration Kits. Kismet. Fate. Impeccable timing. Whatever. 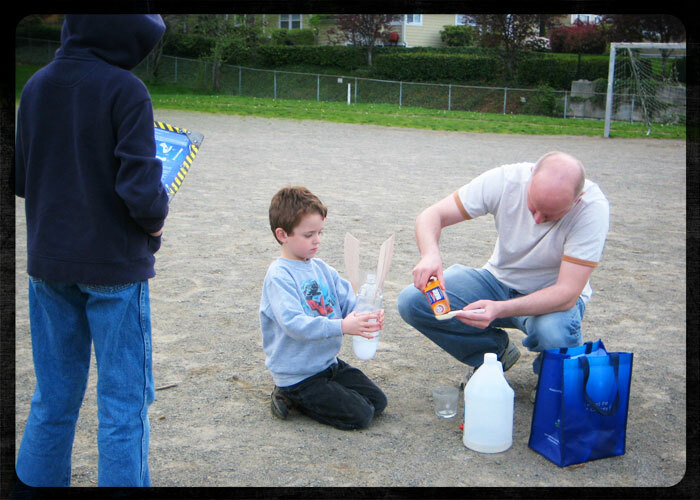 Ye olde vinegar and baking soda rocket. It went up on the third try. At that point, measuring spoons had long been abandoned. A video is in the works. I was reminded of another of our favorite geeky activities while brainstorming photos. Gaming! Carcassonne is always a hit. I must say, however, that we always end up with the most interesting boards when we play with the young ones. 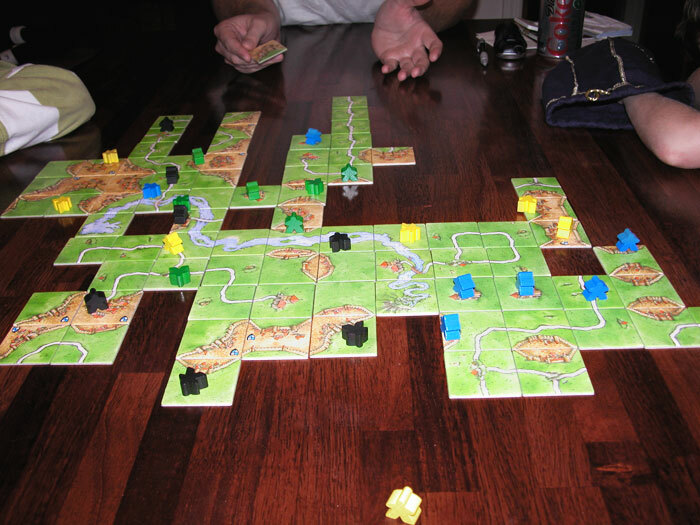 What do we learn by playing Carcassonne? 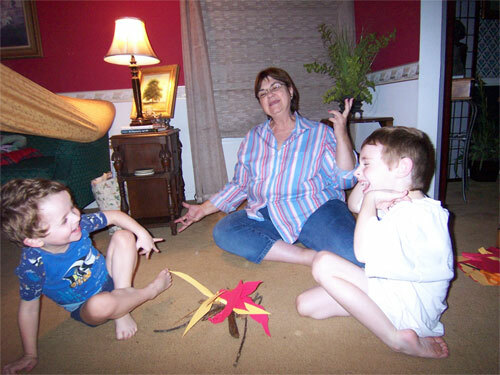 Ever-important social skills…as in, taking turns. Patience…as in waiting for turns. Strategy…is it really a good idea to make five out of your seven meeples farmers right off the bat? Patience…yes, it deserves two mentions. Fine motor skills…line the pieces up straight, or it drives Mom nuts. I put it to you that learning how not to drive your mother insane is an important lesson, geek or not. I’m lucky, because I’m the daughter of a cancer survivor. 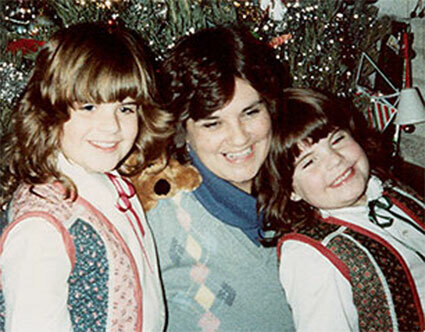 Mom was diagnosed with Hodgkin’s Lymphoma in December of 1982. I know I’m lucky, because I have friends who were not so lucky. We need more research, so little girls and boys don’t have to grow up without mommies or daddies, and mommies and daddies don’t have to lose their babies. 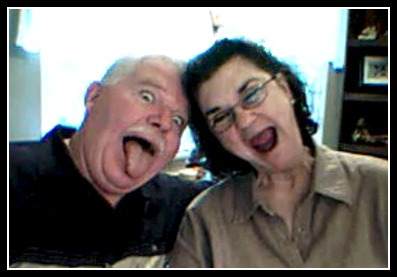 And so more couples can celebrate their 42nd wedding anniversaries – and beyond – together. Next month, I’m traveling to California to see a friend graduate with her master’s degree and to join her at the Relay For Life. I’ve set a modest fundraising goal – $100 – but I need your help to get there. Will you please donate? Whether it’s $5, $15, $50 or $500, it all makes a difference. Please click here or on the Relay For Life button to give what you can. Thanks so much! I have been scatterbrained and completely unfocused on doing anything fun and creative lately. My blog has been withering, the posts have been piling up in my Google Reader, I haven’t done a scrapbook page since leaving Atlanta, the crochet hooks are cold and lifeless. The final straw? I forgot 12 of 12 yesterday. I love 12 of 12. It’s no Bench Monday, but it does make me happy. The solution? I’ve given up on Project 365 (one less thing to think about on a daily basis), and I caught up on my Google Reader, which has inspired me to at least get blogging again. Balance. Isn’t that always the key? It is for me. Funny that using that particular key also happens to be one of my biggest challenges in life. All of this is not to say that life has been boring or that I’ve been unfulfilled – quite the opposite, in fact! We made the decision upon moving here to refrain from participating in any time-consuming extracurricular activities for a while. This has resulted in an unprecedented amount of family togetherness. Board games and garage saling and letterboxing, dinners with all four of us gathered around the table…these are incredibly good things. The boys and I walk back and forth to school most days (a new experience for us all!). They play on the playground after school while I chat with other moms and [hopefully] form some new friendships (…and thank Heaven for my friend j., who provided me with a built-in amazing friendship and support system and tour guide, all in one.). On top of all of this, I desperately need what is usually the first thing to fall by the wayside – creative outlet. Something that’s all mine, and mine alone. My feet on a bench. My hook in some yarn. My hand on the mouse. My fingers on the keyboard. That’s all I need…a lot of one, or a little of each. So, since I spent yesterday morning ironing shirts, this morning calling doctors in Seattle (requesting appointments) and Atlanta (requesting records), and the afternoons on the school playground, I dedicate this evening to me. In Answer to the Unasked Questions: Yes! Did we make it to Seattle? Did the movers get here with all our stuff? Do we have too much of said stuff? Have we gotten any unpacking done? Is it just beyond great to have the family back together again? Tomorrow at this time, most of our stuff will probably be packed on the moving truck. I wonder if the whole moving thing will hit me then. Or will it be when we’re getting on the plane? Or will it be in a few weeks, when we don’t “come home” from Seattle? Mom and Dad: Duh. Hello, they offered up their home long before the thought would have occurred to us. They rearranged the house, gave up grandparental spoiling rights for a few months, and allowed us the greatest gift of all: choice. Because of them, we had the choice of following our dreams when Jason was laid of. 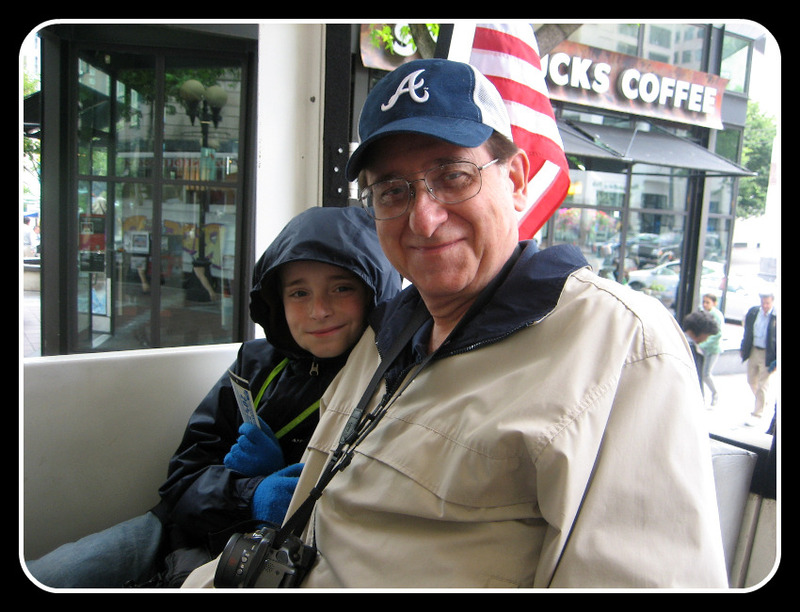 The G Family: Who have put Jason up rent-free since he got to Seattle in early March. 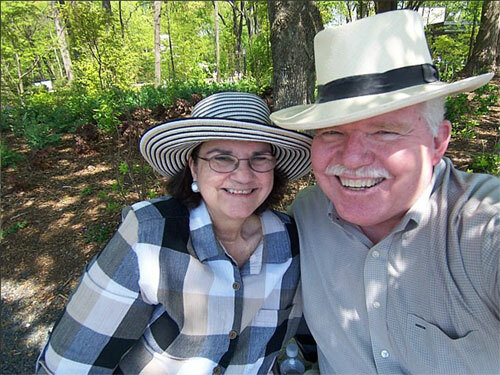 They gave up their privacy and their guest room (a special Thanks to all their other visitors during this time, who were displaced to couches and play rooms), and they provided transportation to and from the airport, great advice, and amazing friendship. Also to their boys for being our boys’ built-in, ready-and-waiting friends in a new place. Jason’s Mom and Dad: Their basement/garage has been our storage area since December, when we started getting the house ready for market. Like my parents, they have also been extremely supportive of our decision to move so far away. My Swister: She told me it was okay if I couldn’t afford to come up for her law school graduation in May, which was incredibly selfless and made me more determined than ever to be there. The R Family, here in the ATL: Heather keeps me sane (and sometimes simply identifies with and validates my insanity), their pool kept us entertained, and the whole family are the best friends we could ask for. 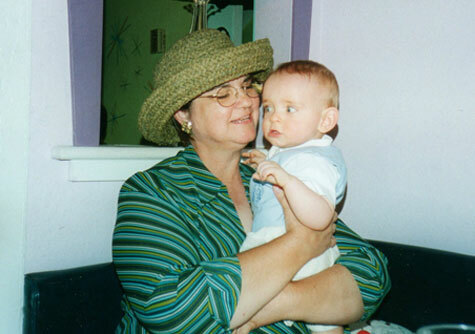 The June Mommies: They keep me sane, too, and are an amazing gift. Our Awesome Realtor, Cheryl: She worked hard and was so helpful in selling our home. She had an emotional interest in doing the best she could for us, and it showed. Dave Ramsey and his Total Money Makeover: We’d been following his plan for nearly two years when this thing began, and without that plan, we would have been in much more dire straits. Everyone Else: Who has prayed for us, visualized us in Seattle, bit their tongue if they thought we were nuts, and loved us. …and last but definitely not least, Jason, Nicolas and Kalen: Jason made the biggest leap possible outside his comfort zone in moving three thousand miles away, not knowing how long it would last, and never having lived apart from family before. The stress has been unbelievable, I know. The boys have handled this thing with amazing grace for nine- and six-year-old kids. A banner? Sure. I’ve been wanting to make a pennant banner for a while anyway…and wouldn’t it be neat if it were a permanent one that we could hang up every time one of us had a birthday? Of course, it had to be made out of materials on hand, but hello, we’re living with my mother! Being a lifelong artist and craftsperson, she’s always a good great phenomenal resource for this kind of project. She and I are also a great brainstorming team, and she manages to turn my ideas into great end products. Some felt, paint, and ribbon (plus a few days of work) later, and voila! Behold our two-sided Family Birthday Banner, courtesy of Grandma Wanda! The letters are done in Aunt Bertha, which I think is such a fun font for a celebratory banner. Thank you, Mommy.